""1962 No. 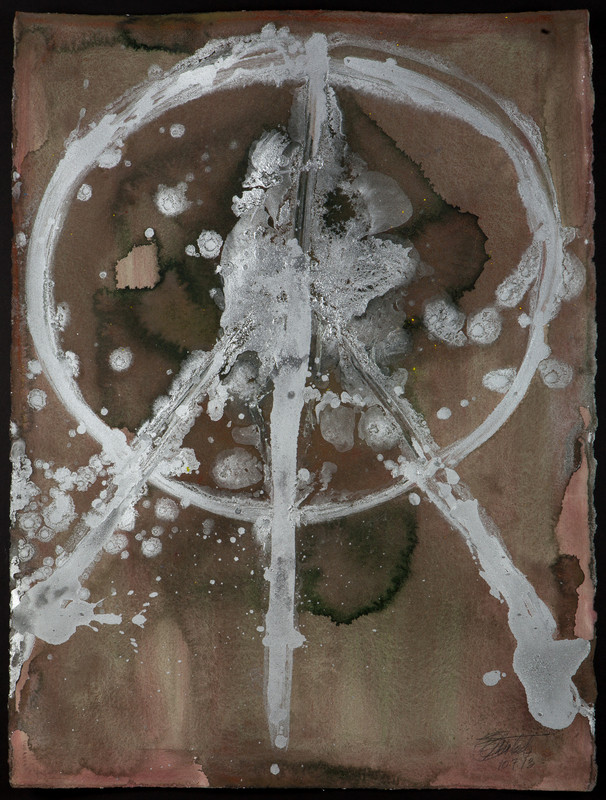 2" | 30" x 22" | watercolor, ink and nuclear stainless core metal from decommissioned nuclear missiles on paper | 2013"
The Peace Signs created including nuclear stainless core metal from decommissioned nuclear missiles are a part of the body of art created on the Peace Angels Project. The Peace Angels Project is a conceptual work of Art whose story is told thru physical works of Art. The Peace Angels Project began November 3, 1992. 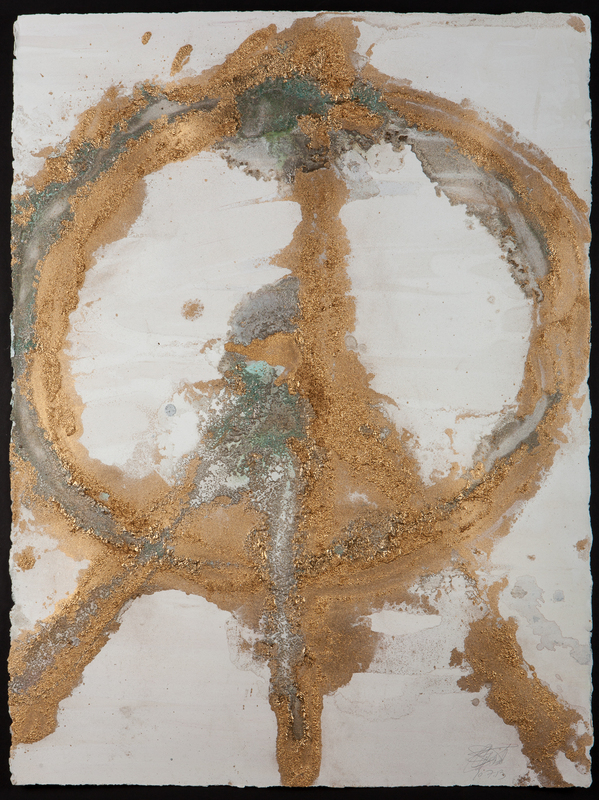 The mission of the Peace Angels Project is to inspire peace by exhibiting Art created from repurposed weapons and images referring to peace. The Peace Sign was originally designed for the British nuclear disarmament movement, the peace sign is a commonly used symbol for peace. North Korea is a dangerous nuclear presence. North Korea has issued a fresh warning of an "all-out war," urging the United States to stop military drills and what it described as "nuclear blackmail." In a thinly veiled threat to strike the US, the North's National Defence Commission, chaired by leader Kim Jong-Un, said on Saturday the US government must withdraw its policy of hostility against the North if it wants peace on both the Korean peninsula and the "US mainland." Japan: "The March 2011 crisis at the Fukushima nuclear power plant was the world's worst nuclear disaster since Chernobyl in 1986." Japan is now asking for global help. There are eight sovereign states that have successfully detonated nuclear weapons. Five are considered to be "nuclear-weapon states" under the terms of the Nuclear Non-Proliferation Treaty (NPT). In order of acquisition of nuclear weapons: the United States, the Russian Federation, the United Kingdom, France, and China. Newly added: India, Pakistan, and North Korea have nuclear weapons. This last hundred years, nuclear weapons have been an issue of global concern. ""1962 No. 15" | 30" x 22" | watercolor, ink and nuclear stainless core metal from decommissioned nuclear missiles on paper | 2013"
The future work to be unveiled at reverie arts gallery in 2014 will include technology that has never been done before. These Peace Signs are a glimpse of the Art to be unveiled in San Francisco at reverie arts at that time. Much like the hands of a clock, the peace signs transition as they follow the evolution of peace over the passage of time. Clocks are ticking towards a time when we as human beings will better collaborate and integrate resources so that we may survive the social, economic and ecological challenges before us. We are asked to take an honest look at the minute-to-minute choices we are making in our lives. How are we treating one another, and how are we treating the planet that we all share? As a young Artist I adopted a Japanese myth about a Samurai who wanted to complete his life as a warrior and become a gentleman. Including cuisine, cultured music and art. The Samurai went to an Artist to ask him to paint a painting for him. The Artist listened patiently as the Samurai told him of his deepest thoughts and yearnings. When he finished speaking, the Artist said he would do the painting under one condition. No money was required up front. The Artist told the Samurai that the condition was that he, the Artist would tell him when it was completed. Six months went by. More months went by. And the Samurai's friends began to jeer him calling him a fool. Chagrined he went back to the Artist who reminded him that he would let the Samurai know when the work of Art was complete. A year went by. A year and a half. By two years, the Samurai was sharpening his sword. He had listened to the jeers and cajoles of his peers long enough. He went to the Artist with battle dress. The Artist told him to come back the next day. Over two years had passed. The next day the Artist let the Samurai into his ante room. There before him on an elegant easel was his painting. Well lit it was astounding. The Samurai almost doubled over. The strength of the painting reached into his very soul. His feelings were a mix of childhood vulnerability and the most heroic courage that he had ever experienced. He felt true love. The Samurai wiped tears from eyes that had rarely experienced such emotion. After a while, he looked at the Artist and humbly said: " I almost killed you. This is the most profound work of art that I have ever seen and it has captured all that I spoke to you about years ago and more. But please tell me, there aren't very many strokes on this paper. What took you so long?" The Artist looked at him and asked him if he would like to sit down and have some tea. The Samurai followed behind him. As the Artist opened the inner door, the Samurai looked up to see thousands of paintings all reflecting the beautiful painting that was now his. In my life, the peace signs are those images. Having painted them throughout the duration of the Peace Angels Project, they capture the vicissitudes of the time that they were painted. 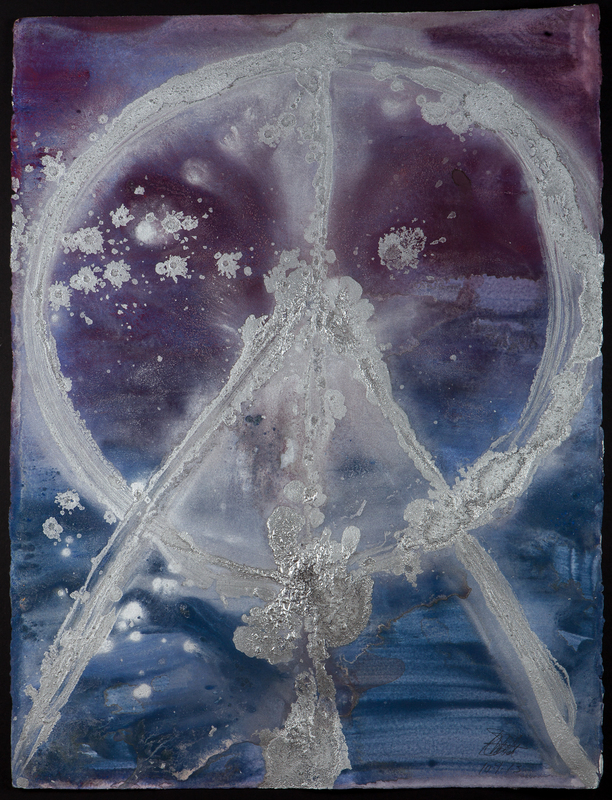 First - The Aquarius Series Peace Signs are reminiscent of the stardust that we are made of. The symbol moves in the ethers. Whirling in three dimensions, it is the symbol incorporated of the straight intersecting the circular to the power of the infinite. ""1962 No. 14" | 30" x 22" | watercolor, ink and on paper nuclear stainless core metal from decommissioned nuclear missiles | 2013"
In 1962, I was in grammar school. My friends and I heard on the radio that we may be under nuclear attack from Russia. The very first set of weapons donated to the Peace Angels Project came from the LA Sheriff's Department (street weapons) and from an organization named Peace Missiles. They gave the first nuclear titanium to us. This titanium was from Russia and that metal was used to create the very first Original Peace Angel sculptures in 1997. One of the owners of Peace Missiles, the professional golf pro, Carey Schuman arranged for then President WJ Clinton to receive the first poured Peace Angel from those same nuclear and street weapons metal. I kept the now famous No. 2. This series of Peace Signs that I have created include nuclear stainless reminiscent of the time period in history that filled us all with fear and dread. Our world has had many problems since then but also many solutions. When Carey spoke at the event to unveil the Renaissance Peace Angel at Crossroads School of Arts & Sciences in 1997, he brought up his concern. He didn't understand how we went from such an overall fear globally to rarely bringing up the nuclear issue at all. His and his partner, John Lisanti's, gift to the Peace Angels Project of the nuclear metal was their way of keeping the awareness alive. On October 22, President Kennedy instituted a "quarantine" on the shipment of offensive missiles to Cuba from the Soviet Union. He also warned Soviet Union that the launching of any missile from Cuba against nations in the Western Hemisphere would bring about U.S. nuclear retaliation on the Soviet Union. A negotiated settlement was achieved in a few days. "1962" is about always remembering and learning from the past, being cognizant of the present and having an eye on the future. As well as the negatives aspects of the nuclear conversation, there is the positive. Bill Gates in Ted Talks discusses a new type of nuclear reactor with zero carbon emissions. He sees this as a way to avoid planetary catastrophe and fuel the world with clean energy. The goal: Zero carbon emissions by 2050 to be funded by him and his peers. ""1962 No. 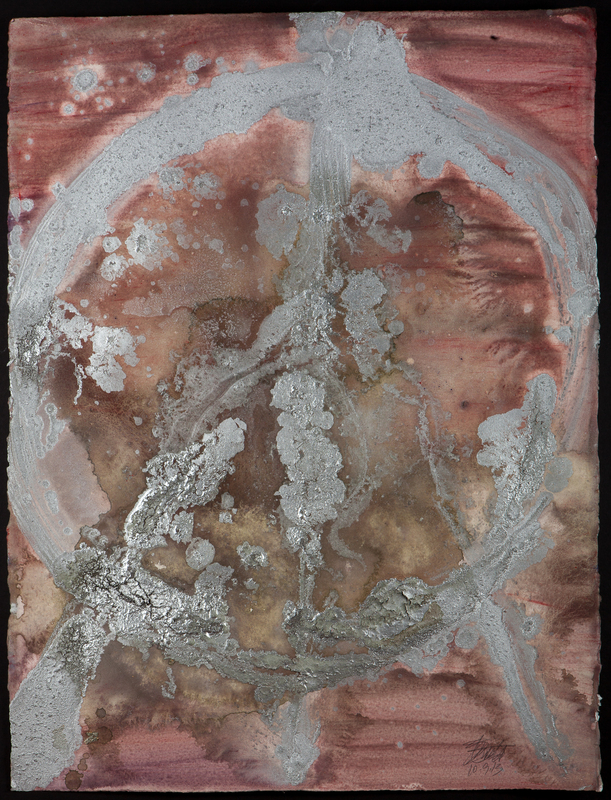 1" | 30" x 22" | watercolor, ink and nuclear stainless core metal from decommissioned nuclear missiles on paper | 2013"
In September 1951 Japan signed a peace treaty with 48 countries in San Francisco. Close examination of treaty drafts reveals key links between the regional Cold War that was unfolding in 1951 and equivocal language about the designation of territory with contentious frontier problems in the contemporary Asia-Pacific. The Acheson Line and Containment Line still divide countries. The global shift to the post-Cold War era indicates the significance of Cold War origins. It is appropriate to pinpoint common origins and consider solutions in a multilateral context. The problem of territorial boundaries are ongoing. November 2, 1960, President John F. Kennedy gave a historic speech at the Cow Palace in San Francisco. Kennedy proposed "a peace corps of talented men and women" who would dedicate themselves to the progress and peace of developing countries. Encouraged by more than 25,000 letters responding to his call, Kennedy took immediate action as president to make the campaign promise a reality. The Peace Corps program was an outgrowth of the Cold War. President Kennedy pointed out that the Soviet Union "had hundreds of men and women, scientists, physicists, teachers, engineers, doctors, and nurses . . . prepared to spend their lives abroad in the service of world communism." The United States had no such program, and Kennedy wanted to involve Americans more actively in the cause of global democracy, peace, development, and freedom. President John F. Kennedy wanted to establish a program with three goals: to meet the needs of countries with trained men and women, to promote a better understanding of Americans to the people being served and to give Americans a better understanding of other cultures. In January 1967, the Human Be-In in Golden Gate Park in San Francisco popularized hippie culture, leading to the legendary Summer of Love on the West Coast of the United States, and the 1969 Woodstock Festival on the East Coast. This dramatic reaction to the Vietnam War had an exponential affect, both good and bad. Nevertheless, focus on peace and the potential for reviewing and responding to decisions outside of the control of those most affected, became a more mainstream and accepted possibility. I moved to San Francisco in 1971. I raised my son here. Traveling and moving have been a part of my work on the Peace Angels Project. It is time to come home. Why have the inaugural exhibition of the Peace Angels Art in San Francisco? Answer: My family is here; alumni of Santa Clara University (where I will speak on November 5th at the DeSaisset Museum), alumni of San Francisco Art Institute; my Silicon Valley technology support, my artworld production support and my gallery. Rêverie Arts' Managing Principal Derek Cabaniss is the new breed of Art Dealer. With a combination of a keen understanding of contemporary art, a background in marketing and an intuitive connection to in person and Internet sales, Derek Cabaniss has a real handle on bringing the Peace Angel art to market. 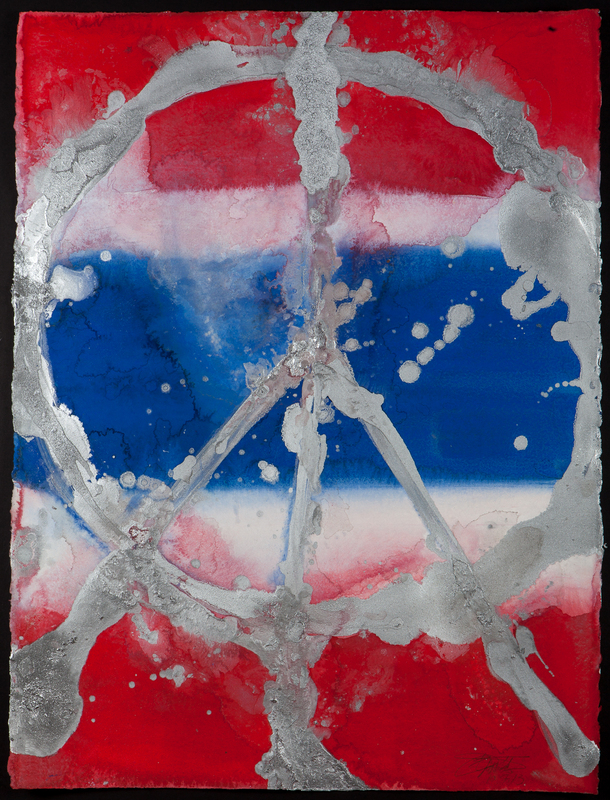 With its technical complexity and socially confrontative nature, the Peace Signs created with real weapons metal, takes a certain kind of art dealer - one who isn't afraid to mix beauty with controversy. It takes a certain eye. Rêverie Arts San Francisco holds true to its brand and mission by striving to host and foster a harmonious working relationship with its talented body of artists to create challenging and rousing series of artworks. The gallery also cultivates a sociable and creative dynamic with its partners in private events to create a space for discussion, creativity, philanthropy and further collaboration within the city of San Francisco. The Peace Signs represent a rich and robust peace for a humanity that can build a healthy peace based on mutual respect and protection from harm - a sustainable one - with advances that mean food for all, a reformed capitalism, and a circular economy. I am holding my vision to support peace on earth. We are just one tiny part of a vast system comprising of 100 billion galaxies. Let us use our time to create an extraordinary life and to build a world of exponential and positive invention. We are made of stardust. Let us remember who we are. Those of us alive at this time have a remarkable opportunity to transcend all that has happened, learn from it and build a world that is sustainable, healthy and rich of life. ""1962 No. 5" | 30" x 22" | watercolor, ink, gold and nuclear stainless core metal from decommissioned nuclear missiles on paper | 2013"
1950-53 - Korean War. The United States responded to North Korean invasion of South Korea by going to its assistance, pursuant to United Nations Security Council resolutions. US forces deployed in Korea exceeded 300,000 during the last year of the conflict. Over 36,600 US military were killed in action. 1950-55 - Formosa (Taiwan). In June 1950 at the beginning of the Korean War, President Truman ordered the U.S. Seventh Fleet to prevent Chinese Communist attacks upon Formosa and Chinese Nationalist operations against mainland China. 1954-55 - China. Naval units evacuated U.S. civilians and military personnel from the Tachen Islands. 1956 - Egypt. A marine battalion evacuated US nationals and other persons from Alexandria during the Suez crisis. 1958 - Lebanon. Lebanon crisis of 1958 Marines were landed in Lebanon at the invitation of President Camille Chamoun to help protect against threatened insurrection supported from the outside. The President's action was supported by a Congressional resolution passed in 1957 that authorized such actions in that area of the world. 1959-60 - The Caribbean. Second Marine Ground Task Force was deployed to protect U.S. nationals following the Cuban revolution. 1959-75 - Vietnam War. U.S. military advisers had been in South Vietnam for a decade, and their numbers had been increased as the military position of the Saigon government became weaker. After citing what he falsely termed were attacks on U.S. destroyers, in what came to be known as the Gulf of Tonkin incident, President Johnson asked in August 1964 for a resolution expressing U.S. determination to support "freedom and protect peace in Southeast Asia." Congress responded with the Gulf of Tonkin Resolution, giving President Johnson authorization, without a formal declaration of war by Congress, for the use of conventional military force in Southeast Asia. Following this resolution, and following a communist attack on a U.S. installation in central Vietnam, the United States escalated its participation in the war to a peak of 543,000 military personnel by April 1969. 1962 - Thailand. The Third Marine Expeditionary Unit landed on May 17, 1962 to support that country during the threat of Communist pressure from outside; by July 30, the 5,000 marines had been withdrawn. 1962 - Cuba. Cuban Missile Crisis On October 22, President Kennedy instituted a "quarantine" on the shipment of offensive missiles to Cuba from the Soviet Union. He also warned Soviet Union that the launching of any missile from Cuba against nations in the Western Hemisphere would bring about U.S. nuclear retaliation on the Soviet Union. A negotiated settlement was achieved in a few days. 1962-75 - Laos. From October 1962 until 1975, the United States played an important role in military support of anti-Communist forces in Laos. 1964 - Congo (Zaire). The United States sent four transport planes to provide airlift for Congolese troops during a rebellion and to transport Belgian paratroopers to rescue foreigners. 1965 - Invasion of Dominican Republic. Operation Power Pack. The United States intervened to protect lives and property during a Dominican revolt and sent 20,000 U.S. troops as fears grew that the revolutionary forces were coming increasingly under Communist control. A popular rebellion breaks out, promising to reinstall Juan Bosch as the country's elected leader. The revolution is crushed when U.S. Marines land to uphold the military regime by force. The CIA directs everything behind the scenes. 1967 - Israel. The USS Liberty incident, whereupon a United States Navy Technical Research Ship was attacked June 8, 1967 by Israeli armed forces, killing 34 and wounding more than 170 U.S. crew members. 1967 - Congo (Zaire). The United States sent three military transport aircraft with crews to provide the Congo central government with logistical support during a revolt. 1968 - Laos & Cambodia. U.S. starts secret bombing campaign against targets along the Ho Chi Minh trail in the sovereign nations of Cambodia and Laos. The bombings last at least two years. 1970 - Cambodian Campaign. U.S. troops were ordered into Cambodia to clean out Communist sanctuaries from which Viet Cong and North Vietnamese attacked U.S. and South Vietnamese forces in Vietnam. The object of this attack, which lasted from April 30 to June 30, was to ensure the continuing safe withdrawal of American forces from South Vietnam and to assist the program of Vietnamization. 1972 - North Vietnam - Christmas bombing Operation Linebacker II. The operation was conducted from 18-29 December 1972. It was a bombing of the cities Hanoi and Haiphong by B-52 bombers. 1973 - Operation Nickel Grass, a strategic airlift operation conducted by the United States to deliver weapons and supplies to Israel during the Yom Kippur War. 1974 - Evacuation from Cyprus. United States naval forces evacuated U.S. civilians during the Turkish invasion of Cyprus. 1975 - Evacuation from Vietnam. Operation Frequent Wind. On April 3, 1975, President Ford reported U.S. naval vessels, helicopters, and Marines had been sent to assist in evacuation of refugees and US nationals from Vietnam. 1975 - Evacuation from Cambodia. Operation Eagle Pull. On April 12, 1975, President Ford reported that he had ordered U.S. military forces to proceed with the planned evacuation of U.S. citizens from Cambodia. 1975 - South Vietnam. On April 30, 1975, President Ford reported that a force of 70 evacuation helicopters and 865 Marines had evacuated about 1,400 U.S. citizens and 5,500 third country nationals and South Vietnamese from landing zones in and around the U.S. Embassy, Saigon and Tan Son Nhut Airport. 1975 - Cambodia. Mayagüez Incident. On May 15, 1975, President Ford reported he had ordered military forces to retake the SS Mayagüez, a merchant vessel which was seized from Cambodian naval patrol boats in international waters and forced to proceed to a nearby island. 1976 - Lebanon. On July 22 and 23, 1976, helicopters from five U.S. naval vessels evacuated approximately 250 Americans and Europeans from Lebanon during fighting between Lebanese factions after an overland convoy evacuation had been blocked by hostilities. 1976 - Korea. Additional forces were sent to Korea after two American soldiers were killed by North Korean soldiers in the demilitarized zone between North and South Korea while cutting down a tree. 1978 - Zaire (Congo). From May 19 through June 1978, the United States utilized military transport aircraft to provide logistical support to Belgian and French rescue operations in Zaire. 1980 - Iran. Operation Eagle Claw. On April 26, 1980, President Carter reported the use of six U.S. transport planes and eight helicopters in an unsuccessful attempt to rescue the American hostages in Iran. 1981 - El Salvador. After a guerrilla offensive against the government of El Salvador, additional U.S. military advisers were sent to El Salvador, bringing the total to approximately 55, to assist in training government forces in counterinsurgency. 1981 - Libya. First Gulf of Sidra Incident On August 19, 1981, U.S. planes based on the carrier USS Nimitz shot down two Libyan jets over the Gulf of Sidra after one of the Libyan jets had fired a heat-seeking missile. The United States periodically held freedom of navigation exercises in the Gulf of Sidra, claimed by Libya as territorial waters but considered international waters by the United States. 1982 - Sinai. On March 19, 1982, President Reagan reported the deployment of military personnel and equipment to participate in the Multinational Force and Observers in the Sinai. Participation had been authorized by the Multinational Force and Observers Resolution, Public Law 97-132. 1982 - Lebanon. Multinational Force in Lebanon. On August 21, 1982, President Reagan reported the dispatch of 800 Marines to serve in the multinational force to assist in the withdrawal of members of the Palestine Liberation force from Beirut. The Marines left September 20, 1982. 1982-83 - Lebanon. On September 29, 1982, President Reagan reported the deployment of 1200 marines to serve in a temporary multinational force to facilitate the restoration of Lebanese government sovereignty. On September 29, 1983, Congress passed the Multinational Force in Lebanon Resolution (P.L. 98-119) authorizing the continued participation for eighteen months. 1983 - Egypt. After a Libyan plane bombed a city in Sudan on March 18, 1983, and Sudan and Egypt appealed for assistance, the United States dispatched an AWACS electronic surveillance plane to Egypt. Urgent Fury. Citing the increased threat of Soviet and Cuban influence and noting the development of an international airport following a coup d'état and alignment with the Soviets and Cuba, the U.S. invades the island nation of Grenada. 1983-89 - Honduras. In July 1983, the United States undertook a series of exercises in Honduras that some believed might lead to conflict with Nicaragua. On March 25, 1986, unarmed U.S. military helicopters and crewmen ferried Honduran troops to the Nicaraguan border to repel Nicaraguan troops. 1983 - Chad. On August 8, 1983, President Reagan reported the deployment of two AWACS electronic surveillance planes and eight F-15 fighter planes and ground logistical support forces to assist Chad against Libyan and rebel forces. 1984 - Persian Gulf. On June 5, 1984, Saudi Arabian jet fighter planes, aided by intelligence from a U.S. AWACS electronic surveillance aircraft and fueled by a U.S. KC-10 tanker, shot down two Iranian fighter planes over an area of the Persian Gulf proclaimed as a protected zone for shipping. 1985 - Italy. On October 10, 1985, U.S. Navy pilots intercepted an Egyptian airliner and forced it to land in Sicily. The airliner was carrying the hijackers of the Italian cruise ship Achille Lauro who had killed an American citizen during the hijacking. 1986 - Libya. Action in the Gulf of Sidra (1986) On March 26, 1986, President Reagan reported on March 24 and 25, U.S. forces, while engaged in freedom of navigation exercises around the Gulf of Sidra, had been attacked by Libyan missiles and the United States had responded with missiles. 1986 - Libya. Operation El Dorado Canyon. On April 16, 1986, President Reagan reported that U.S. air and naval forces had conducted bombing strikes on terrorist facilities and military installations in the Libyan capitol of Tripoli, claiming that Libyan leader Col. Muammar al-Gaddafi was responsible for a bomb attack at a German disco that killed two U.S. soldiers. 1986 - Bolivia. U.S. Army personnel and aircraft assisted Bolivia in anti-drug operations. 1987 - Persian Gulf. USS Stark was struck on May 17 by two Exocet antiship missiles fired from an Iraqi F-1 Mirage during the Iran-Iraq War, killing 37 U.S. Navy sailors. 1987 - Persian Gulf. Operation Nimble Archer. Attacks on two Iranian oil platforms in the Persian Gulf by United States Navy forces on October 19. The attack was a response to Iran's October 16, 1987 attack on the MV Sea Isle City, a reflagged Kuwaiti oil tanker at anchor off Kuwait, with a Silkworm missile. 1987-88 - Persian Gulf. Operation Earnest Will - After the Iran-Iraq War (the Tanker War phase) resulted in several military incidents in the Persian Gulf, the United States increased U.S. joint military forces operations in the Persian Gulf and adopted a policy of reflagging and escorting Kuwaiti oil tankers through the Persian Gulf to protect them from Iraqi and Iranian attacks. President Reagan reported that U.S. ships had been fired upon or struck mines or taken other military action on September 21 (Iran Ajr), October 8, and October 19, 1987 and April 18 (Operation Praying Mantis), July 3, and July 14, 1988. The United States gradually reduced its forces after a cease-fire between Iran and Iraq on August 20, 1988. It was the largest naval convoy operation since World War II. 1987-88 - Persian Gulf. Operation Prime Chance was a United States Special Operations Command operation intended to protect U.S.-flagged oil tankers from Iranian attack during the Iran-Iraq War. The operation took place roughly at the same time as Operation Earnest Will. 1988 - Persian Gulf. Operation Praying Mantis was the April 18, 1988 action waged by U.S. naval forces in retaliation for the Iranian mining of the Persian Gulf and the subsequent damage to an American warship. 1988 - Honduras. Operation Golden Pheasant was an emergency deployment of U.S. troops to Honduras in 1988, as a result of threatening actions by the forces of the (then socialist) Nicaraguans. 1988 - Panama. In mid-March and April 1988, during a period of instability in Panama and as the United States increased pressure on Panamanian head of state General Manuel Noriega to resign, the United States sent 1,000 troops to Panama, to "further safeguard the canal, US lives, property and interests in the area." The forces supplemented 10,000 U.S. military personnel already in the Panama Canal Zone. 1989 - Libya. Second Gulf of Sidra Incident On January 4, 1989, two U.S. Navy F-14 aircraft based on the USS John F. Kennedy shot down two Libyan jet fighters over the Mediterranean Sea about 70 miles north of Libya. The U.S. pilots said the Libyan planes had demonstrated hostile intentions. 1989 - Panama. On May 11, 1989, in response to General Noriega's disregard of the results of the Panamanian election, President Bush ordered a brigade-sized force of approximately 1,900 troops to augment the estimated 1,000 U.S. forces already in the area. 1989 - Colombia, Bolivia, and Peru. Andean Initiative in War on Drugs. On September 15, 1989, President Bush announced that military and law enforcement assistance would be sent to help the Andean nations of Colombia, Bolivia, and Peru combat illicit drug producers and traffickers. By mid-September there were 50-100 U.S. military advisers in Colombia in connection with transport and training in the use of military equipment, plus seven Special Forces teams of 2-12 persons to train troops in the three countries. 1989 - Philippines. Operation Classic Resolve. On December 2, 1989, President Bush reported that on December 1, Air Force fighters from Clark Air Base in Luzon had assisted the Aquino government to repel a coup attempt. In addition, 100 marines were sent from U.S. Naval Base Subic Bay to protect the United States Embassy in Manila. 1989-90 - Panama. Operation Just Cause. On December 21, 1989, President Bush reported that he had ordered U.S. military forces to Panama to protect the lives of American citizens and bring General Noriega to justice. By February 13, 1990, all the invasion forces had been withdrawn. [RL30172] Around 200 Panamanian civilians were reported killed. The Panamanian head of state, General Manuel Noriega, was captured and brought to the U.S.
1990 - Liberia: On August 6, 1990, President Bush reported that a reinforced rifle company had been sent to provide additional security to the U.S. Embassy in Monrovia, and that helicopter teams had evacuated U.S. citizens from Liberia. 1990 - Saudi Arabia: On August 9, 1990, President Bush reported that he launched Operation Desert Shield by ordering the forward deployment of substantial elements of the U.S. armed forces into the Persian Gulf region to help defend Saudi Arabia after the August 2 invasion of Kuwait by Iraq. On November 16, 1990, he reported the continued buildup of the forces to ensure an adequate offensive military option. [RL30172]American hostages being held in Iran. [RL30172] Staging point for the troops was primarily Bagram air field. 1991 - Iraq and Kuwait. Operation Desert Storm: On January 16, 1991, in response to the refusal by Iraq to leave Kuwait, U.S. and Coalition aircraft attacked Iraqi forces and military targets in Iraq and Kuwait in conjunction with a coalition of allies and under United Nations Security Council resolutions. In February 24, 1991, U.S.-led United Nation (UN) forces launched a ground offensive that finally drove Iraqi forces out of Kuwait within 100 hours. Combat operations ended on February 28, 1991, when President Bush declared a ceasefire. 1991-1996 - Iraq. Operation Provide Comfort: Delivery of humanitarian relief and military protection for Kurds fleeing their homes in northern Iraq during the 1991 uprising, by a small Allied ground force based in Turkey which began in April 1991. 1991 - Iraq: On May 17, 1991, President Bush stated that the Iraqi repression of the Kurdish people had necessitated a limited introduction of U.S. forces into northern Iraq for emergency relief purposes. 1991 - Zaire: On September 25-27, 1991, after widespread looting and rioting broke out in Kinshasa, Air Force C-141s transported 100 Belgian troops and equipment into Kinshasa. American planes also carried 300 French troops into the Central African Republic and hauled evacuated American citizens. 1992 - Sierra Leone. Operation Silver Anvil: Following the April 29 coup that overthrew President Joseph Saidu Momoh, a United States European Command (USEUCOM) Joint Special Operations Task Force evacuated 438 people (including 42 Third Country nationals) on May 3. Two Air Mobility Command (AMC) C-141s flew 136 people from Freetown, Sierra Leone, to the Rhein-Main Air Base in Germany and nine C-130 sorties carried another 302 people to Dakar, Senegal. 1992-1996 - Bosnia and Herzegovina: Operation Provide Promise was a humanitarian relief operation in Bosnia and Herzegovina during the Yugoslav Wars, from July 2, 1992, to January 9, 1996, which made it the longest running humanitarian airlift in history. 1992 - Kuwait: On August 3, 1992, the United States began a series of military exercises in Kuwait, following Iraqi refusal to recognize a new border drawn up by the United Nations and refusal to cooperate with UN inspection teams. 1993 - Macedonia: On July 9, 1993, President Clinton reported the deployment of 350 U.S. soldiers to the Republic of Macedonia to participate in the UN Protection Force to help maintain stability in the area of former Yugoslavia. 1994-1995 - Haiti. Operation Uphold Democracy: U.S. ships had begun embargo against Haiti. Up to 20,000 U.S. military troops were later deployed to Haiti to restore democratically-elected Haiti President Jean-Bertrand Aristide from a military regime which came into power in 1991 after a major coup. 1994 - Macedonia: On April 19, 1994, President Clinton reported that the U.S. contingent in Macedonia had been increased by a reinforced company of 200 personnel. 1995 - Bosnia. Operation Deliberate Force: In August 30, 1995, U.S. and NATO aircraft began a major bombing campaign of Bosnian Serb Army in response to a Bosnian Serb mortar attack on a Sarajevo market that killed 37 people in August 28, 1995. This operation lasted until September 20, 1995. The air campaign along with a combined allied ground force of Muslim and Croatian Army against Serb positions led to a Dayton agreement in December 1995 with the signing of warring factions of the war. As part of Operation Joint Endeavor, U.S. and NATO dispatched the Implementation Force (IFOR) peacekeepers to Bosnia to uphold the Dayton agreement. 1996 - Liberia. Operation Assured Response: On April 11, 1996, President Clinton reported that on April 9, 1996 due to the "deterioration of the security situation and the resulting threat to American citizens" in Liberia he had ordered U.S. military forces to evacuate from that country "private U.S. citizens and certain third-country nationals who had taken refuge in the U.S. Embassy compound...."
1996 - Central African Republic. Operation Quick Response: On May 23, 1996, President Clinton reported the deployment of U.S. military personnel to Bangui, Central African Republic, to conduct the evacuation from that country of "private U.S. citizens and certain U.S. government employees", and to provide "enhanced security for the American Embassy in Bangui. "United States Marine Corps elements of Joint Task Force Assured Response, responding in nearby Liberia, provided security to the embassy and evacuated 448 people, including between 190 and 208 Americans. The last Marines left Bangui on June 22. 1997 - Albania. Operation Silver Wake: On March 13, 1997, U.S. military forces were used to evacuate certain U.S. government employees and private U.S. citizens from Tirana, Albania. 1997 - Congo and Gabon: On March 27, 1997, President Clinton reported on March 25, 1997, a standby evacuation force of U.S. military personnel had been deployed to Congo and Gabon to provide enhanced security and to be available for any necessary evacuation operation. 1997 - Sierra Leone: On May 29 and May 30, 1997, U.S. military personnel were deployed to Freetown, Sierra Leone, to prepare for and undertake the evacuation of certain U.S. government employees and private U.S. citizens. 1997 - Cambodia: On July 11, 1997, In an effort to ensure the security of American citizens in Cambodia during a period of domestic conflict there, a Task Force of about 550 U.S. military personnel were deployed at Utapao Air Base in Thailand for possible evacuations. 1998 - Iraq. Operation Desert Fox: U.S. and British forces conduct a major four-day bombing campaign from December 16-19, 1998 on Iraqi targets. 1998 - Guinea-Bissau. Operation Shepherd Venture: On June 10, 1998, in response to an army mutiny in Guinea-Bissau endangering the U.S. Embassy, President Clinton deployed a standby evacuation force of U.S. military personnel to Dakar, Senegal, to evacuate from the city of Bissau. 1998-1999 - Kenya and Tanzania: U.S. military personnel were deployed to Nairobi, Kenya, to coordinate the medical and disaster assistance related to the bombing of the U.S. Embassies in Kenya and Tanzania. 1998 - Afghanistan and Sudan. Operation Infinite Reach: On August 20, President Clinton ordered a cruise missile attack against two suspected terrorist training camps in Afghanistan and a suspected chemical factory in Sudan. 1998 - Liberia: On September 27, 1998, America deployed a stand-by response and evacuation force of 30 U.S. military personnel to increase the security force at the U.S. Embassy in Monrovia. 1999-2001 - East Timor: Limited number of U.S. military forces deployed with the United Nations-mandated International Force for East Timor restore peace to East Timor. 1999 - Serbia. Operation Allied Force: U.S. and NATO aircraft began a major bombing of Serbia and Serb positions in Kosovo in March 24, 1999, during the Kosovo War due to the refusal by Serbian President Slobodan Milosevic to end repression against ethnic Albanians in Kosovo. This operation ended in June 10, 1999, when Milosevic agreed to pull out his troops out of Kosovo. In response to the situation in Kosovo, NATO dispatched the KFOR peacekeepers to secure the peace under UNSC Resolution 1244. 2000 - Sierra Leone. On May 12, 2000 a U.S. Navy patrol craft deployed to Sierra Leone to support evacuation operations from that country if needed. 2000 - Yemen. On October 12, 2000, after the USS Cole attack in the port of Aden, Yemen, military personnel were deployed to Aden. 2000 - East Timor. On February 25, 2000, a small number of U.S. military personnel were deployed to support the United Nations Transitional Administration in East Timor (UNTAET). 2001 - On April 1, 2001, a mid-air collision between a United States Navy EP-3E ARIES II signals surveillance aircraft and a People's Liberation Army Navy (PLAN) J-8II interceptor fighter jet resulted in an international dispute between the United States and the People's Republic of China called the Hainan Island incident. 2001 - War in Afghanistan. The War on Terrorism begins with Operation Enduring Freedom. On October 7, 2001, U.S. Armed Forces invade Afghanistan in response to the 9/11 attacks and "begin combat action in Afghanistan against Al Qaeda terrorists and their Taliban supporters." 2002 - Yemen. On November 3, 2002, an American MQ-1 Predator fired a Hellfire missile at a car in Yemen killing Qaed Salim Sinan al-Harethi, an al-Qaeda leader thought to be responsible for the USS Cole bombing. 2002 - Philippines. OEF-Philippines. January 2002 U.S. "combat-equipped and combat support forces" have been deployed to the Philippines to train with, assist and advise the Philippines' Armed Forces in enhancing their "counterterrorist capabilities." 2002 - Côte d'Ivoire. On September 25, 2002, in response to a rebellion in Côte d'Ivoire, U.S. military personnel went into Côte d'Ivoire to assist in the evacuation of American citizens from Bouake. 2003-2011 - War in Iraq. Operation Iraqi Freedom. March 20, 2003. The United States leads a coalition that includes the United Kingdom, Australia and Poland to invade Iraq with the stated goal being "to disarm Iraq in pursuit of peace, stability, and security both in the Gulf region and in the United States." 2003 - Liberia. Second Liberian Civil War. On June 9, 2003, President Bush reported that on June 8 he had sent about 35 U.S. Marines into Monrovia, Liberia, to help secure the U.S. Embassy in Nouakchott, Mauritania, and to aid in any necessary evacuation from either Liberia or Mauritania. 2003 - Georgia and Djibouti. "US combat equipped and support forces" had been deployed to Georgia and Djibouti to help in enhancing their "counterterrorist capabilities." 2004 - Haiti. 2004 Haïti rebellion occurs. The US first sent 55 combat equipped military personnel to augment the U.S. Embassy security forces there and to protect American citizens and property in light. Later 200 additional US combat-equipped, military personnel were sent to prepare the way for a UN Multinational Interim Force, MINUSTAH. 2004 - War on Terrorism: U.S. anti-terror related activities were underway in Georgia, Djibouti, Kenya, Ethiopia, Yemen, and Eritrea. 2005-06 - Pakistan. President Bush deploys troops from US Army Air Cav Brigades to provide Humanitarian relief to far remote villages in the Kashmir mountain ranges of Pakistan stricken by a massive earthquake. 2006 - Lebanon. U.S. Marine Detachment, the 24th Marine Expeditionary Unit begins evacuation of U.S. citizens willing to leave the country in the face of a likely ground invasion by Israel and continued fighting between Hezbollah and the Israeli military. 2007 - Somalia. Battle of Ras Kamboni. On January 8, 2007, while the conflict between the Islamic Courts Union and the Transitional Federal Government continues, an AC-130 gunship conducts an aerial strike on a suspected al-Qaeda operative, along with other Islamist fighters, on Badmadow Island near Ras Kamboni in southern Somalia. 2008 - South Ossetia, Georgia. Helped Georgia humanitarian aid, helped to transport Georgian forces from Iraq during the conflict. In the past, the US has provided training and weapons to Georgia. 2011 - Drone strikes on al-Shabab militants begin in Somalia. This marks the 6th nation in which such strikes have been carried out, including Afghanistan, Pakistan, Iraq, Yemen and Libya.